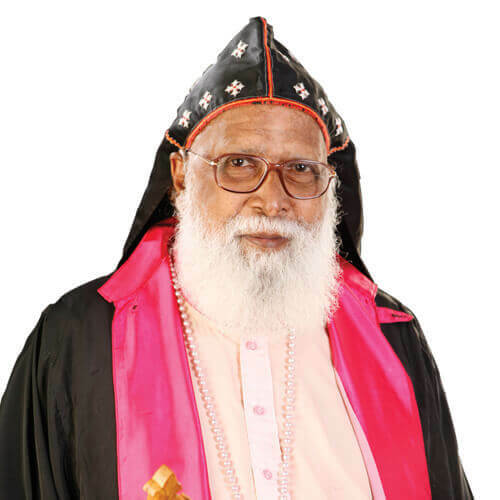 His Grace Philipose Mar Chrysostom Mar Thoma Valiya Metropolitan, an outstanding personality remarkable for brilliant ideas and inborn sense of humour, was born in Adangappurath Kalamannil, a family of priestly tradition. He was born as the son of Very Rev. K.E. Oommen Kassessa, Vicar General of the Mar Thoma Church and Sosamma of Nadukkeveetil family, Karthikappally on 27th April 1918. Philip Oommen was known as Dharmistan at home. His character fully justified that name. Right from childhood he accepted as life’s principle and fully supported justice and morality. After school education in Maramon, Kozhencherry and Eraviperoor he obtained BA Degree from Union Christian (UC) College, Alwaye. His commitment to spread the gospel of Jesus Christ made young Philip Oommen involve in missionary work in Ankola, Karnataka. He ventured to accept this as a challenge when Missionary work in Karnataka was in a crisis. After working there from 1940 to 1942 he started Theological studies in United Theological College, Bangalore. He was ordained as Deacon on 1st January 1944 and as Kasessa on 3rd June. Along with theological studies he fulfilled the duty of leading the Bangalore Parish. After participating in the activities of Ankola Ashram for some time he served as Vicar of Kottarakkara, Mylom, Pattamala, Manganam St. Peters and Thiruvananthapuram parishes. Rev. Philip Oommen along with Rev. Dr. M.G. Chandy and Rev. P. Thomas got ordained as Ramban on 20th May, 1953 and as Episcopa on 23rd May with the name Philipose Mar Chrysostom Episcopa. Later history proved that he richly deserved the name of St. Chrysostom of the golden tongue. He joined St. Augustine’s College, Canterbury, England to pursue further theological studies. On his return in 1954 he was given responsibility of Kottayam-Kunnamkulam Diocese and the Mar Thoma Vaideeka Seminary. During this period he represented the Mar Thoma Church in the Evanston Conference of the World Council of Churches. When Thomas Mar Athanasius Episcopa completed his tenure as the Missionary Bishop, Mar Chrysostom took up the responsibility with his office and residence at Olivet Aramana, Chengannur. He played a pivotal role during this period to widen the mission activities of the Church by visiting the parishes, Ashrams and mission centres outside Kerala there by giving fellowship and spiritual leadership to the workers there. He paid special attention to the spiritual nourishment of youths as well. On completion of service as the missionary Bishop he served as the Diocesan Episcopa of Adoor- Kottarakkara. During this period he was the President of Sevika Sanghom, Sunday School Samajam and Kerala Christian Council also. He was the President of Christian Auxillary for Social Action as well. From 1975 once again he became missionary Bishop and was head of Thiruvananthapuram – Kollam, Adoor – Mavelikkara, Ranni – Nilackal and Chengannur – Thumpamon Dioceses thereafter. Thirumeni’s special concern for socially and economically backward parishes is note worthy. He formulated and implemented projects to improve the social, economic and cultural condition of the backward parishes of South Travancore. He believed that the way to the creator was through the creations of God. He was exalted to the positions of Suffragan Metropolitan in May 1978, Officiating Metropolitan on 15th March 1999 and Metropolitan on 23rd October 1999. As Metropolitan he led the Church and also the Niranam – Maramon Diocese. The basic quality of Mar Chrysostom Metropolitan is a pleasant attitude. His main medium of communication is pleasant talk containing humorous words and action. Such humorous conversation and speeches spread a pleasant feeling around. The humour of Thirumeni is very famous. Many books and documentaries have been published containing his humorous speeches and talks. Some of them are “Mar Chrysostom makes us laugh and we think”, “Listen O Heavens – hear O Earth”, “100 platforms with Mar Chrysostom”, “He summons us”, “Chrysostom Metropolitan the Prophet of Divine Universe”, “The Christian Mission in Market Community”, “Mission in the Market Place”, “Sketches and Speeches”, “Mar Chrysostom – an Assessment – Documentary”, “Laughter and thought –Documentary”. Considering the contributions of Thirumeni to Theology the Serampore University honoured him by awarding a Doctorate Degree. He attended the 2nd Vatican Council summoned by Pope John 23rd as Official observer of the Mar Thoma Church. He always found time to get in touch with individuals in various parishes of Dioceses. He was very keen to conduct meetings of clergy very meaningfully. Chrysostom Metropolitan is unparalleled with his touching style of speech full of humorous statements and broad minded love of humanity. He is a devout idealist. Mar Chrysostom is a talented steersman able to guide the Church boat correctly to the destination as the times demand knowing the pulse of the period. He is endowed with an extra ordinary and indescribable talent to mingle with the youth to enter into a dialogue with them imbibing modern views. His presence enables each and everyone to overcome any highly complicated situation with the help of his inborn sense of humour. Moving on to be a hundred in age Thirumeni is able to remain youthful in thought, vision and words. The Mar Thoma Church decided to build houses for 1,500 homeless people by imbibing his vision on the occasion of his 90th birthday. As His Grace Philipose Mar Chrysostom Valiya Metropolitan is busy in action forgetting his advanced age, his spiritual leadership and sense of direction is a great blessing for the Church and society. He is now living in Maramon Jubilee Home after voluntarily retiring from administrative responsibilities on 1st October 2007. But he is leading a very active life style even now. He has given a new meaning to retirement by his present way of life. He visits many people and many people visit him in search of the noble experience of being in the presence of a sublime personality. His presence is required not just in Church gatherings. Various religious and cultural organizations demand his advice and blessings. His magnetic personality inspires each and every one who gets in touch with him. In connection with the hundredth Birthday, the Church decided to construct 100 homes for the homeless and also implemented a Project among Transgenders, to uphold and respect their identity. This is a unique and novel venture by any Christian Churches in Kerala. On the eve of Republic day in 2018, considering the services to the society, the nation decided to award Padma Bhushan to Tirumeni and on 20th March 2018, Tirumeni received the award from the President of India Sri. Ram Nath Kovind.